How commited am I to my book…? If anyone is wondering how committed I am to my middle grade fantasy novel, the answer is: so committed I put it on my body. A big part of my body. My book features a May Blossom, also called a White Thorn tree, one type fabled to be a fairy tree. These legendary trees are (SPOILERS) gateways to the fairy realm, and are sacred to the hidden folk. To this day in Ireland construction projects get rerouted or outright canceled if it’s discovered they will require the destruction of a fairy tree or fairy road (a path the good people take from tree to something else, and back). These trees are a big deal. When they blossom, they’re covered in gorgeous little white flowers. Later in the year, the stunning red berries take over. Sharp thorns are a constant. So beautiful are these trees, I decided that it would make a great tattoo! 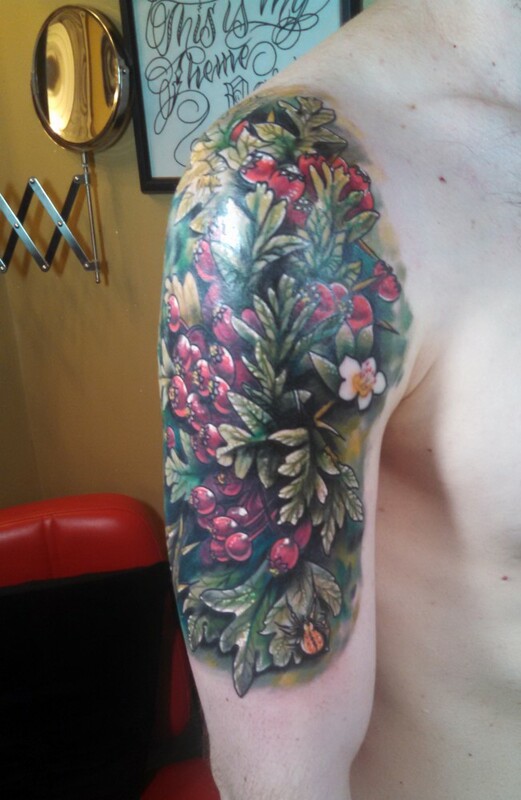 The tattoo was done by the outstanding tattoo artist Grant Lubbock at his shop, Red Baron Ink, in NYC’s East Village. It took seven hours’ish over two sitting. Grant’s a beast. You can contact him through his web site, and look for RBITattoo on Instagram (no, he’s not paying me to put this in here, I just think he’s that good and can’t recommend him enough).